Elder can be used in many ways. Firstly, the flowers are edible and make good fritters. Secondly, the flowers make a good soft drink. Take 12 flower heads and add to 2kg sugar and 500ml vinegar in 10 litres of water. Keep in a warm place and wait a few days. And finally, the fruits produce a good jam, juice or wine. Many fungi grow on trees or dead branches. One, which is mostly seen on elder (and is edible!) 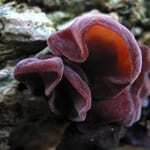 resembles an ear – hence its name (Auricularia auricula). 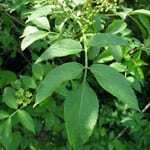 The leaves consist of 5-7 leaflets, in pairs with a single end leaflet. Each leaflet is elliptical with regular teeth and a pointed tip. The top of the leaflets is dark green and matt. The underside is paler. The leaves are opposite – literally appearing from buds that are placed opposite each other along the stem. Masses of creamy white flowers appear in late-May and June. They have a sweet smell that attracts many insects. If you are foraging for flowers, use a pair of secateurs or sharp scissors and cut the flower heads just below where the stems converge. Gather only a few flowers from each tree to leave as many as possible to develop into berries. 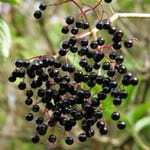 The berries ripen from green to purple-black and are about 5-7mm in diameter. Ripening in September, they can be quickly eaten by thrushes and starlings. Each berry contains vitamins and minerals, but they are not suitable for eating raw. They won’t cause any digestive problems when cooked. The bark is greyish-brown. The young bark contains a lot of ‘warts’ called lenticels. 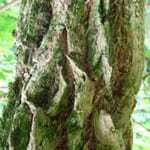 As the bark becomes older, it develops deep creases. The young branches are very brittle and filled with a creamy-white pithy tissue used for holding plant material if you want to cut it into very thin slices (for viewing under the microscope for example). The hollow branches make a good musical instrument! 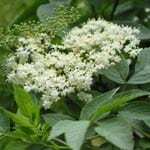 Normally, elder needs a rich and damp soil. Its natural habitat is on river banks and in wet woodlands. But you can find elder almost anywhere. 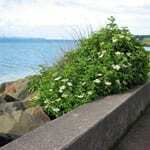 It is a very common shrub, often colonising new open ground. It is even found growing through gaps in paving or walls.